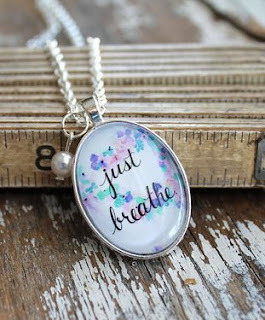 One Momma Saving Money: Inspirational Just Breathe Pendant Necklace - $9.99 + Free Shipping! Inspirational Just Breathe Pendant Necklace - $9.99 + Free Shipping! This motivational pendant is a sweet reminder to help you get through your day! Just breathe, because this, too, shall pass. The pendant comes on a 24" rolo chain. The necklace comes packaged in an organza gift bag.